Plunger Pot with bristle brushes to remove mud, dirt, road salt, and lawn chemicals from paws. Keeps cars, floors, and furniture dirt-free. Medium: for most dog breeds—15 - 80 lbs. Large: for big dog breeds—over 80 lbs. Dimensions (in packaging): 10.7" x 8.3" x 6"
This was a gift. The recipient has 3 dogs, so this has been a blessing. One dog is very skittish and he really likes it! My goldendoodle tolerated this tool and it works. This was my first purchase. Perfect solution. Bought one for my lab, my oldest daughter’s golden and my youngest daughter’s golden doodle. Wish I had this years ago. Wouldn’t it be swell if our dogs would wipe their paws on the mat before they raced into the house? Talk about a dream come true. But we live in the real world, where the next best thing is the ingenious PawPlunger. 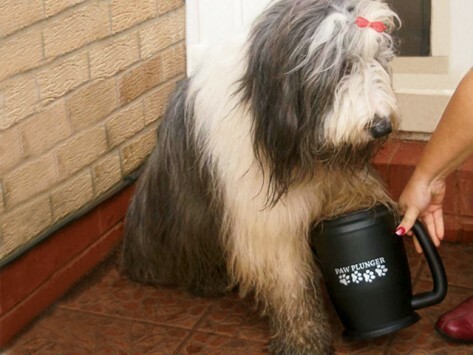 It looks like an oversize coffee mug and it works like a miniature car wash for your dog’s paws. Simply fill the PawPlunger with warm water, place a paw inside, then plunge gently. The paw-friendly bristles inside the device brush away the grime and irritants. Voila, clean paws. There are no muddy towels left by the door, no salt or chemicals from the roads to hurt your pup or get dragged onto your carpet. And that awkward wrestling match by the sink with your best friend? Eliminated. It even comes with a spill-proof lid so you can bring it along in the car. The inspiration for the PawPlunger is LuLu, a Wheaton Terrier with a fondness for romps in Central Park. The creator is Brianne Leary (you might know her as the host of Animal Planet’s Petsburgh series). Brianne came up with the idea for the PawPlunger after countless struggles to keep LuLu’s paw prints out of her apartment. She teamed up with co-inventor Andrew Taylor to develop the idea, and the rest is history. Pawsitively genius.